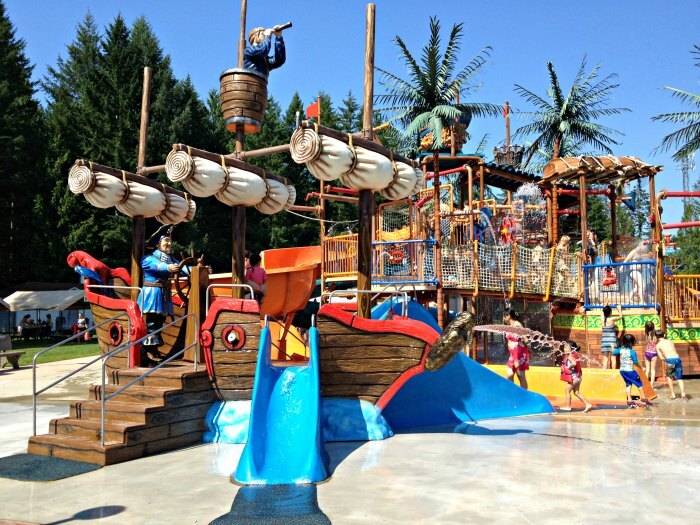 Cultus Lake Waterpark is a splashing good time for the whole family! On hot summer days when I was growing up, my mom would take us to the lake. 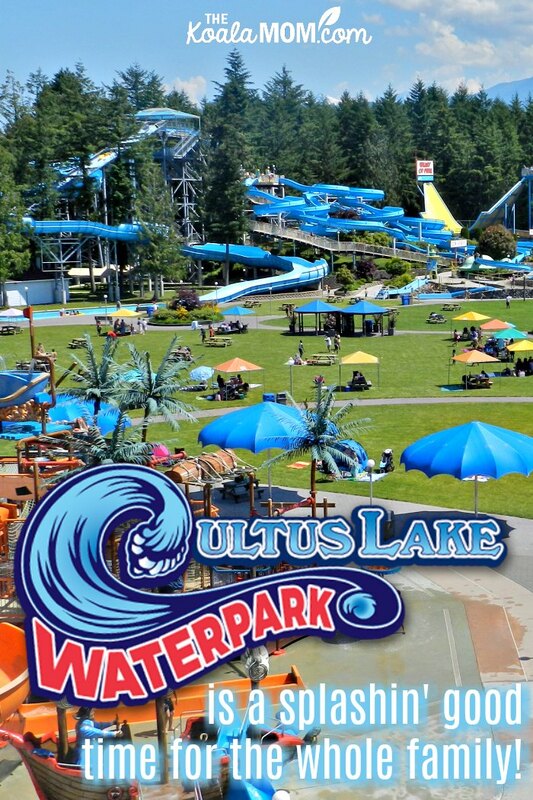 These days, I’m the one looking for a place to cool off when the temperatures get over 25* C. Around Vancouver, one of the coolest places for hot summer days is Cultus Lake Waterpark! 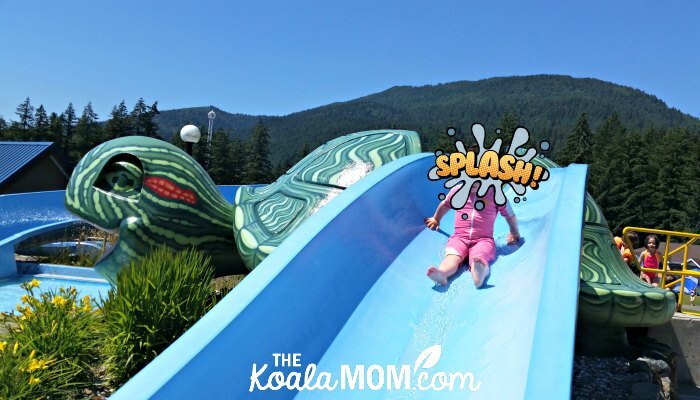 BC’s biggest waterpark offers a splashing good time for the whole family. I received compensation for this post, but all opinions expressed are always my own. One of my first questions with rides and slides is the height restrictions. We haven’t been to a waterpark in over a decade because we’ve always had babies around—and my girls tend to be a bit petite. So before we headed up to Cultus Lake Waterpark, I measured all the girls and checked the height limits online. Sunshine and Lily were over 48″ tall (able to ride any slide); 5-year-old Jade was 36-42″ (able to ride a couple slides on her own and others with me); and 2-year-old Pearl was under 36″ (able to ride one slide with me and play in the toddler areas). There are plenty of picnic tables and shelters around the waterpark. On a busy day, however, these are occupied quickly. If you do have a sun shelter, many other families brought their own shade and picnic blankets. I’d also bring lots of waterbottles and sunscreen, of course. I recommend grabbing a map to the waterpark on your way in. I didn’t think of this until we’d been there for a couple hours. If you have kids of varying ages and heights, having the map makes it easier to plan who can ride where. Most of the slides form a sort of semi-circle around the central area of the park, so it’s easy to find your way around once you’re there. For waterparks, I have swimsuits for the girls that cover more. Sunshine has a nice set that’s like a tank top and shorts, and Pearl’s suit (above) is UV-proof and goes to her knees and elbows. My husband put the swim bag in the van before I’d had a chance to repack it, so the older girls were wearing their Speedo suits, which I usually save for the pool. I splashed on sunscreen when we arrived, and they were fine all day. However, I forgot to sunscreen my own back, and I got a good burn. I need to get myself a better “outdoor” swimsuit for the summer, and next time, I’ll remember to pack the girls’ outdoor suits as well. We arrived at the waterpark just before noon and found a shady picnic table. My husband maintained “command central” here for the rest of the day. He kept an eye on our stuff, watched Joey explore the grass nearby, held Joey when he was ready for his naps, and kept track of where all the girls were in the park. We let Sunshine (10) and Lily (8) ride the slides themselves. They had two rules: they had to stick together and they had to check in with Daddy after 2 rides. They enjoyed this measure of independence and only argued about slides once or twice. Lily tends to be more cautious than Sunshine, so she didn’t want to try the Valley of Fear (even though she’d been down Tubular Terror already!). Jade and Pearl started by exploring the Turtle Pool & Slides. This was toddler central! We showed Pearl where to find the stairs and how to get off the slides. She’s a huge fan of slides at any playground and pool we visit, so she was in her element. Three of the slides in this area end in little splash pools; two end in a pool, where parents can wait to catch their children. While Joey napped, I took Pearl and Jade down Blaster & Twister. This is the only slide that Pearl (under 36″) could ride with me, and the only “big” slide that Jade could ride by herself. 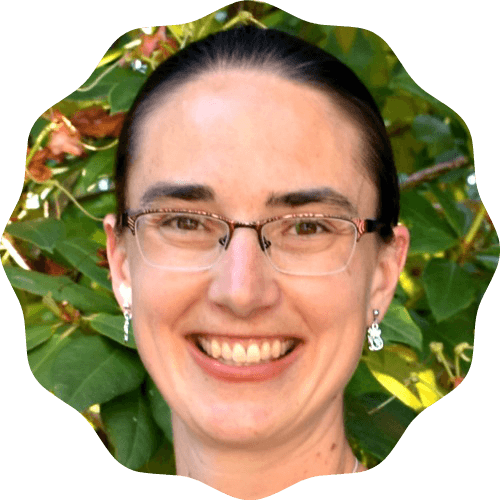 While I tried to keep Pearl from joining another group in the lineup, I talked to Jade about how much fun she has on Grandma D’s water slide (my mom works at a pool) and how this slide would be just like that (well, a bit bigger). Jade can be a bit cautious at times, so I didn’t want her to decide not to slide after I’d landed at the bottom with Pearl. 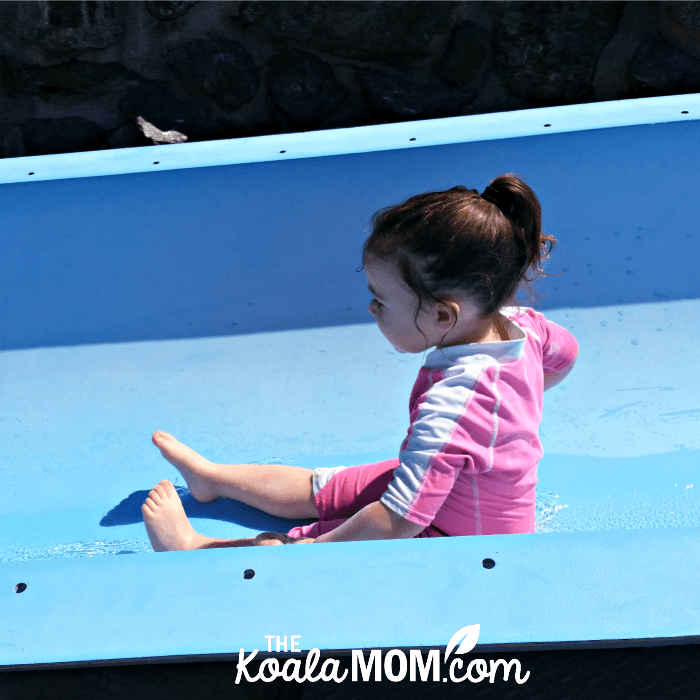 When it was our turn, I climbed onto the slide, lifted Pearl onto my lap, and we were off! I yelled “wheeeee” lots because I couldn’t see Pearl’s face in front of me. At the bottom, we landed in the pool and I lifted her quickly out of the water. Then we sat waiting for Jade… and waiting… and waiting… Finally, I saw a whoosh of water that signaled her arrival and then she splashed into the pool. I quickly went to meet her, but she was already dog-paddling towards me, with her nose up. She wasn’t happy, however. Grandma D’s pool ends in a small runway at the bottom, like the Turtle Slides. Jade hadn’t expected to be dumped into a pool and the surprise made her upset. We talked about it all the way back to where Daddy was waiting. Then I noticed the complimentary life jackets, and asked Jade if she wanted one. Immediately she wanted to go back down Blasters & Twisters with her life jacket. 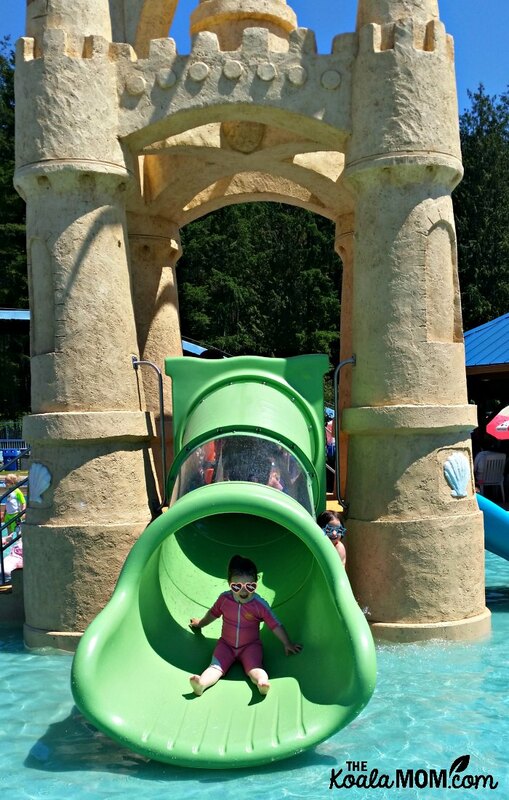 Where can babies & toddlers play at Cultus Lake Waterpark? Like I said, we’ve avoided waterparks for the past few years because it seems like something for “big kids” to do. Now that we have kids from 0 – 10, finding activities that they can all do and enjoy together is getting more challenging. But Cultus Lake Waterpark met that challenge, with tons of activities for the whole family, even the littlest ones. Joey spent most of the day crawling around the shade of our picnic table or napping with Daddy. At 6 months old, he’s a busy little guy who likes to be on the go when he’s awake. He also watched his sisters play on the Turtle Slides. His favourite part of the park was probably the Tots Castle. This new play area is built just for little swimmers and sliders. Joey was able to sit in the shallow water and splash to his heart’s content, or crawl around the edges where the water was only a couple inches deep. The Tots Castle features six small slides. It has a large, shallow pool around it with a rubber bottom. There’s a giant beach ball in one corner that sprays water, and a “water gun” in another corner. All the girls had fun playing here at various times during the day. 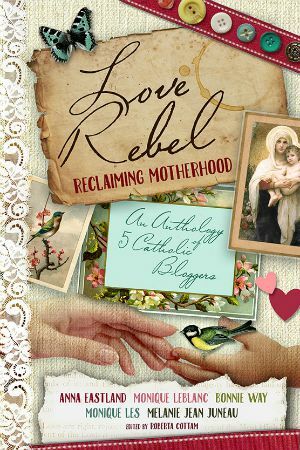 Pearl is my adventuresome two-year-old who likes doing whatever her big sisters are doing. She was up for any of the slides (probably even the ones she wasn’t allowed on). She was happy to run between all the slides and was able to get on and off all the slides in the Turtle area and the Tots Castle herself. Win win for this independent little soul! It also made it easy for Daddy to keep an eye on her and hold a sleeping Joey when her big sisters were off riding bigger slides. Between the Turtle Pool & Slides and the Tots Castle is a new family spray park. We aren’t huge fans of spraying water, so the girls spent more time on the slides than in the spray park. They did all run through it at various times, though, and stop to turn some toys or catch some water. There’s also a hot tub hugging one end of the spray park, if you’re there on a cool day (or really like the heat). I liked having these three toddler-friendly play spaces located conveniently close to each other (and to the family washrooms). Our picnic table was located near here, so it was easy to go back and forth with Jade and Pearl as they played. Pirates Cove is another play area intended for younger children. It was on the other side of the park, but I ventured over there with the youngest three (and later sent the older two over to check it out as well). If your kids love splashing water, this would also be a good place to settle down for the day, as there are washrooms and restaurants close by. When Jade, Pearl and I wandered over, the pirate ship was a hive of activity. Kids were running and sliding and shrieking, and water was spraying. A big pirate’s head fills with water and dumps every couple of minutes. We skirted around most of the spraying water as I looked for the best way up to a small slide for the girls. With Joey on my arm, Pearl clutching my finger, and Jade trailing behind, we wandered up a ramp. Coming around a corner, I discovered we’d have to cross a few feet of netting to get to the slide. As I turned to ask Jade what she wanted to do, Pearl put one hand over her eyes to keep the spraying water out and stepped out onto the net. Laughing aloud, I pulled her back again. There was no way Jade was going across the net!!! One of the best parts of our day at Cultus Lake Waterpark was being able to spend time with each of my kids. Standing in line with your child gives you plenty of time to talk—about the slides, yes, but also about other things as well. While we waited in line for one slide, I told Sunshine, Lily and Jade about the first time I’d gone to a waterpark, when I was about Sunshine’s age. One of my favourite rides was Colossal Canyon. This ride was super popular and always had long lineups, but you can ride in groups of four or five, so the line goes pretty quickly. Everyone sits in a giant inner tube and hangs on tight. Sunshine, Lily, Jade and I went down it together and I loved seeing the expressions on their face as we swooshed back and forth down the slide! On my way over there, I thought about how Sunshine had wanted to ride a few bigger slides but couldn’t because Lily didn’t want to. So I invited her to join me. We dashed up the stairs to the shortest lineup in the waterpark. Sunshine wanted to go first and made the mistake of looking over the edge. She said, “No way!” and backed off the slide. So, while she went over to the Speedslide, I sat down at the top of Freefall, crossed my legs and arms as required, and pushed myself over. You know, as a mom, you don’t get many opportunities for an adrenaline rush, unless it’s spotting your toddler at the top of the climbing wall at the park or reaching into your pocket for the keys that aren’t there (because you put them in your purse instead). Every once in a while, it’s nice to do something crazy and daring and just plain thrilling… like drop straight down a waterslide into a spray of water, going faster than a Challenger on Highway 1. I had a bit of time to wait for Sunshine at the bottom, as her line up was longer. Then we walked back to collect the other girls, and our things, and change, and head home. We’d had a fantastic day at the waterpark. The girls are still talking about their favourite slides and which ones they want to ride next time we go. It’s the stuff of summer memories, as I know well. Cultus Lake Waterpark is about an hour and a half from Vancouver (depending on traffic), making it easy to spend a day there. 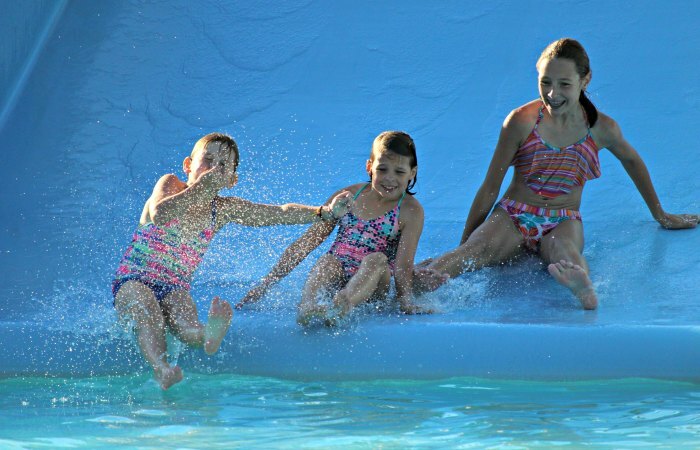 You can also turn your waterpark day into a weekend or longer visit by camping at Cultus Lake. The provincial park has three beautiful campgrounds located on or near the shore of the lake, just minutes away from the Waterpark. Come back the next day to play at the Cultus Lake Adventure Park or do some hiking or boating around the lake. Baby-friendly? Yes, there were baby change tables in the centrally-located family washrooms and plenty of places where even a baby can enjoy the water. Fees: a family of four can spend the day at the waterpark for about $100. Rates are based on height and the time of your visit. 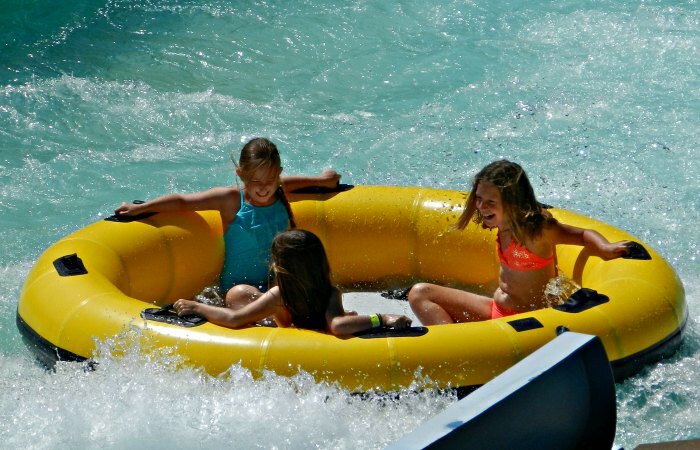 Have you visited Cultus Lake Waterpark yet this summer? What are your best memories there?